eDiets, online at eDiets.com, offers a meal delivery service so you can get healthful food delivered conveniently to your door. eDiets allows you to personalize your menus and get dietitian support so you can soon be on the fast track to losing weight. Choose from over 20 different diet plans and read about success stories at eDiets. With eDiets you can not only register for a meal delivery plan, but also receive a customized fitness plans. eDiets is all about supporting you in your journey to lose weight and be healthy. Remember, RetailSteal.com has the best eDiets coupon codes, eDiets promotions, and eDiets discounts. At eDiets, orders ship within 1-2 business days. For international orders, check website to see if eDiets ships to you. Make returns within 30 days of receipt. See full details on website; exclusions may apply. Get three weeks of meals for free + free shipping at eDiets with our exclusive RetailSteal coupon code. Click link to take advantage of this offer. Save 25% on any diet plan from eDiets when you use this coupon code. Click to save. Save 15% on a 5 or 7 day meal plan using this coupon code at eDiets. Click here to shop. At eDiets, save 15% on the Biggest Loser Diet Meal Plan with the coupon code. Click link for savings. Use the coupon code and save $140 on food per month at eDiets. Click link to save. 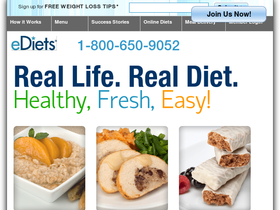 Check out eDiets and receive free shipping when you order a 5 or 7 day home delivery plan. Use the code to enjoy these savings. eDiets offers programs that will help you lose 10 pounds for the low price of $20. Shop online at eDiets today and enjoy a 10% discount on the Biggest Loser meal plan when you enter our coupon code at checkout.